Former New England Quarterback Drew Bledsoe and John Ingoldsby during Patriots' Hall of Fame Induction Weekend in Foxboro. IIR Sports President John Ingoldsby talks Red Sox with ESPN Anchorwoman Linda Cohn during a Great Fenway Park Writers Series luncheon. 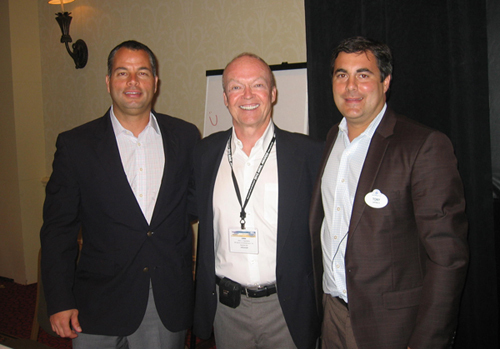 IIR Sports Inc. President John Ingoldsby, center, recently moderated a sports panel at the Public Relations Society of America (PRSA) International Conference in Orlando, FL, featuring Joel Schuchmann, left, Director of Communications for the Professional Golfers Association (PGA), and Tony Morreale, right, Publicity Manager at Disney Destinations. The session was entitled "Entertaining Game Attendees Beyond The White Lines," and was offered by the PRSA's Entertainment and Sports Section, for which John currently serves on the Executive Committee following his two years as Co-Chair. 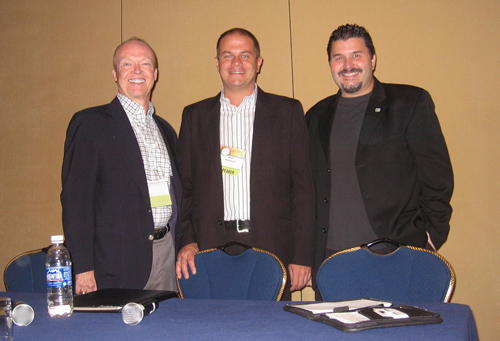 IIR Sports Inc. President John Ingoldsby, left, recently moderated a sports panel at the Public Relations Student Society of America (PRSSA) International Conference in Orlando, FL, featuring Mark Sadowski, center, Public Relations Director at Walt Disney Parks & Resorts, and Gabriel Gabor, right, International Communications Consultant at Major League Soccer/Soccer United Marketing. The session, which for the second year in a row with John as Moderator was held before a room filled with hundreds of college PR students, was entitled "Breaking Into The Business of Sports," and was offered by the PRSA's Entertainment and Sports Section, for which John currently serves on the Executive Committee following his two years as Co-Chair. 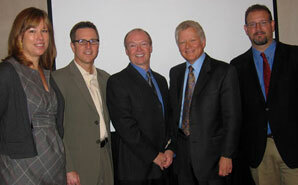 In October 2010, IIR President John Ingoldsby, standing, who served as past co-chair of the Entertainment & Sports Section for the Public Relations Society of America (PRSA) moderated a panel of sports luminaries comprised of, from left, Doug Hicks, Senior Vice President, Marketing Communications, D.C. United Soccer; Kurt Kehl, Corporate Communications /Chief Communications Officer for Monumental Sports & Entertainment: and Wendy Washington, Executive Vice President of Media Relations for Jive Label Group at the Public Relations Student Society of America (PRSSA) International Conference in Washington, D.C. before a standing-room-only audience of more than 350 PR students at the Marriott Wardman Hotel. John Ingoldsby is an award-winning sports executive, who has conducted a variety of sports marketing activities for both athletes and organizations, while also serving as Co-Chairperson of the Executive Committee of the Entertainment and Sports Section for the Public Relations Society of America (PRSA). Additionally, John is a veteran free-lance sports writer who writes about the National Football League (NFL), while also having the unique distinction of covering two legendary NFL dynasties, the current New England Patriots and the “Steel Curtain Era” Pittsburgh Steelers. He wrote a Special Advertising Section on NFL Player Engagement in the annual 2012 sports issue of Bloomberg Businessweek, and he has also had articles published in London-based Financial Times, The Philadelphia Daily News, The Boston Globe Armchair General, Patriots Insider (in affiliation with SCOUT.COM and Fox Sports), Patriots Football Weekly, Fullcourt.com, The Boston College Gridiron Club Gazette, MetroWest (MA) Daily News, and The Johnstown (PA) Tribune Democrat. John was also a sports columnist and beat writer while working at various newspapers, including the Worcester Telegram, Lowell Sun, Fairmont Times, Englewood Herald, and Altoona Mirror. Additionally, John is a guest lecturer teaching journalism and public relations at Salem State University, Curry College, and Harvard University Extension, as well as participating in a Case Study at the renowned Boston University College of Communications. US Women’s Lacrosse Player Kristen Kjellman is interviewed by Young Broadcasters of America during Stars &amp; Stripes Lacrosse event at Harvard Stadium. 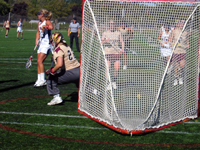 BOSTON, MA, SEPTEMBER 28, 2010 – Six former Massachusetts high school lacrosse stars will return to the Bay State as members of the World Champion U.S. Women’s National Lacrosse Team during the annual Stars & Stripes Lacrosse weekend on Oct. 9-10 at Harvard University. This reigning World Cup Champion women’s team won the Gold Medal last year by beating Australia 8-7 in Prague, Czech Republic. Kristen Kjellman signs autographs for eager fans following victory over Harvard. The women’s team features six former Massachusetts high school lacrosse stars, including Kristen Kjellman of Westwood, who won three straight national championships at Northwestern from 2005 to 2007, becoming the first-ever athlete to win the Tewaaraton Award in consecutive years as the top player in college lacrosse (the equivalent of college football’s Heisman Trophy); Sarah Albrecht of Braintree, Kjellman’s teammate on two of the Northwestern national championship teams; Sarah Bullard of Needham who plays at Duke; Kristin Igoe of Framingham who plays at Boston College; and Katy Fitzgerald of North Andover, who plays at North Carolina; and Jennifer Russell of Andover, who played for the Tar Heels. The US Lacrosse event also will include games with the U.S. Women's National U-19 Team, which has three Massachusetts high school players, and the World Champion U.S. Men’s National Lacrosse Team, which includes several Massachusetts natives and members of the Boston Cannons of Major League Lacrosse. The 38-player women’s national team opponents include Harvard University, Boston College and Boston University. The U-19 women will play the Revolution Lacrosse Club and Massachusetts Elite Lacrosse Club, while the men’s team will play Harvard. There also will be two-hour instructional clinics for U.S. Lacrosse youth members on Sunday morning, hosted by members of the national teams. To register and for more information, please visit http://www.uslacrosse.org/starsstripes2010. Also that morning, Sports Psychologist Dr. Richard Ginsburg will speak to parents and coaches at 9 a.m. at the Harvard Sports Complex. 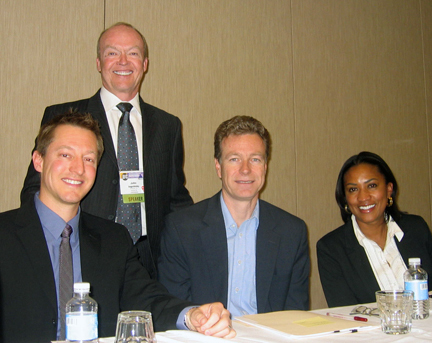 IIR President John Ingoldsby, center, co-chair of the Entertainment &amp;amp; Sports Section for the Public Relations Society of America (PRSA), moderated a panel of sports luminaries at the PRSA International Conference in Detroit. Before a large audience of PR practitioners at the Marriott Renaissance Center, John served as moderator for a spirited and informative panel comprised of, from left, Hanna Pantle, assistant vice president of corporate media relations for BMI; Chris Ender, senior vice president of CBS Communications; Tim Pendell, senior director of community affairs for the Detroit Lions; and Ramsey Poston, managing director of corporate communications for NASCAR.